If you’re intent on boozing it up while you’re sky high, you might want to avoid U.S. airlines completely—with maybe the exception of American Airlinesand Delta. 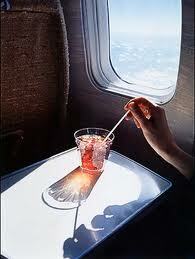 Here’s a pretty good rundown on who does and (doesn’t) serve alcohol on flights these days. It’s fair to say that with airlines charging for basic sustenance these days that they wouldn’t give alcoholic drinks away for free. Apparently, many airlines still do, especially for international flights.